Just a horrible story out of Summit Park, Utah for any dog lover. A mountain lion, that had apparently made itself at home in the neighborhood, attacked two dogs one night. The larger of the two, a black lab named Casper, got away with puncture wounds to his head and neck, but the smaller one, an Australian shepherd, was not so lucky. The lion had carried it off. 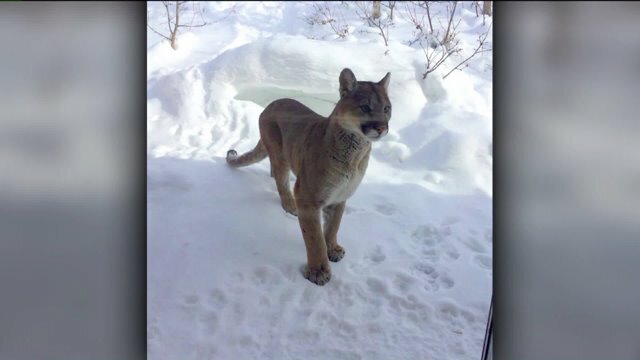 When Susan Strauss went looking for her lost dog, she came face-to-face with the cougar beneath a neighbor’s porch. Strauss called wildlife officials who shot the animal in the head. When they went to retrieve the cat’s body, they found the woman’s beloved pet. The same cat had startled another neighbor earlier that night. Heidi Hewitt saw the cat casually walking on her porch as if it was out for a stroll, she told the news station. “As pretty as the cat was, I was really in awe that it was right there, I kind of wanted to pet it, but I was terrified to even open my door,” Hewitt said. That was probably a good idea.